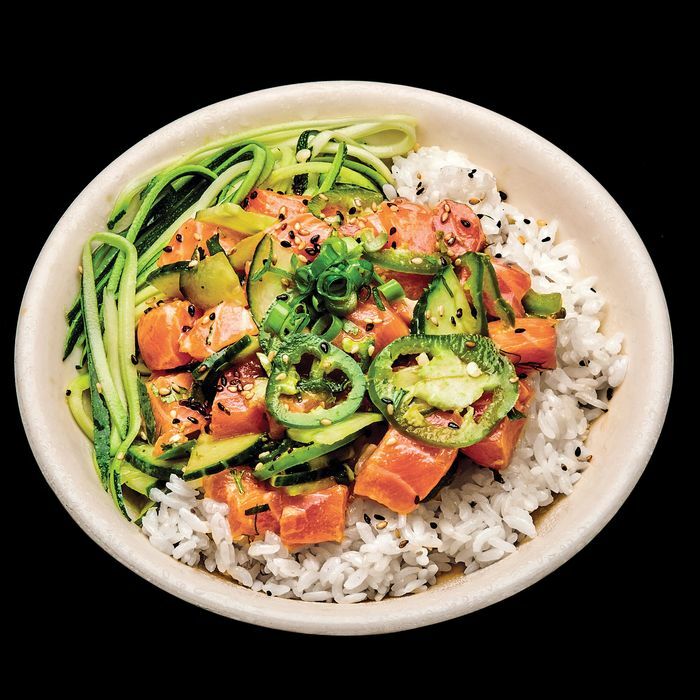 The Hawaiian raw-fish salad is New York’s newest bowl food. Here’s where to find the seasonal seafood and not-so-classic accompaniments. Health nerds will love the attention to sourcing and options like a base of zucchini noodles instead of rice for your bowl. Get this: The Heat Wave, with salmon, jalapeños, cucumber, and spicy citrus shoyu. $11 for a regular. A tiny takeout café whose décor ranges from celebrity quotes to a character from the cult cat-themed cell-phone game Neko Atsume. Get this: The octopus bowl with avocado, ginger, seaweed, carrots, wasabi tobiko, masago, and (optional add-on) cornflakes. $9.50. Pardon the cliché, but it’s “Chipotle style” at this great option for midtown-worker lunches. Get this: The Omakase Premium with sashimi tuna, albacore, salmon, and spicy tuna; add fresh ginger, fish roe, seaweed, crispy-rice bits, and yuzu aïoli. $15. Here’s a new fast-casual twist: the Filipino taquería, from a 20-something second-generation Filipino chef. Get this: The Poke Me, with quarter-inch-thick bites of tuna dressed in a sweet miso sauce, avocado, pickled red onion, and carrots arranged atop coconut steamed rice. $15. This traveling stand has an additional location at the new Gansevoort Market. Get this: Poke nachos — a messy pile of wonton chips covered in spicy tuna, yuzu guacamole, gochujang, and scallions. $13.50. This spacious, calming restaurant has a pleasant back room with a skylight, cafeteria-style seating, and photos of beach scenes. Get this: A vegetarian bowl mixing golden beets and tofu dressed in poke sauce (soy, ginger, sesame); add avocado and garlic crispies. $9.75. The main draw here is the well-sourced, exceptionally fresh fish (if your order takes a while, it’s probably because the cooks are breaking down a whole fish for it in the open kitchen); the chef worked previously at Neta and Masa. Get this: The Chojang Hirame, a simple, spicy bowl with fluke, seaweed, and cucumber. $14 for a regular.